Based at the Millennium Gallery, the Playground is a week-long interactive art exhibition held every year at the Children’s Media Conference, curated for 5-12 years olds (but enjoyable for all ages). The theme for this year’s Playground is Music and Response, with a host of auditory, interactive experiences to enjoy. • Projects focused on bringing together technology and play. • Games to encourage noisy play and music making. • Listen Manja Ebert’s immersive interpretation of internet culture’s impact on teenagers today. Open to all, and completely free, the Playground is part of the Children’s Media Conference that kids and adults alike will not want to miss. With work from a host of artists across the UK, there is so much to see and do, including; Tunin’, by the Royal College of Art; The YATATOY arcade, By YATATOY; and Dance and Doodle, by YouTube Kids. 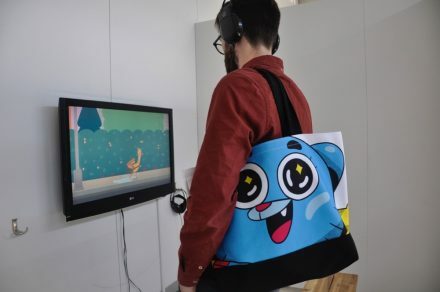 There is a focus on encouraging children to get stuck in and play, and this can be seen all around the gallery – there are kids of all ages playing at every exhibit, learning the relationships between play, technology, and music. Movement, light and music is explored by Tine Bech Studio’s The Light Bug, a digitally enhanced swing which features responsive light, colour and sound as you swing. Children have been integral to the design and development of the Playground exhibits, with an example of this being the Pattern+Code Exhibition, a collaboration between artist Alex MacLean and Year 4 pupils from Wybourn Community Primary School. Pattern+Code brings together the ancient Andean digital technology of Khipu and contemporary live coding techniques to create rhythms based on the patterns. Manja Ebert’s ‘Listen’, designed for 6-16-year-olds, can also be experienced in the Playground. The immersive installation explores constructions of identity and self-representation in young people online. The installation shows boys and girls singing covers of popular songs, with their voices all building together to form a single soundscape. There is a lot to see at the Playground 2018, including a live algorithmic drumming performance from Crofton Academy School students at 12noon on the 6th of July.